A fleet of winged spacecraft, the likes of which we’ll never see again. 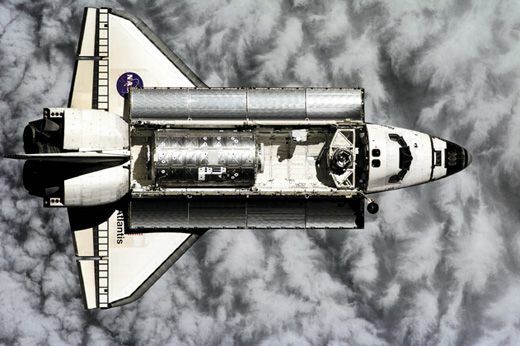 The principle of form following function may never find a truer expression than in the space shuttle. Its designers started with the cargo it would carry — an Air Force satellite 60 feet long and 15 feet in diameter — and built the ship around it. And since the ship was intended to leave its cargo in orbit and return to Earth, onto the payload bay the engineers attached a graceful delta wing and vertical tail. As delivery trucks go, this one sure was elegant. The blunt nose was a compromise between a pointy jet nose cone to slip through the atmosphere and a capsule belly optimal for reentry. The gray nose cap and tuxedo-like stripe along the wing leading edges were composed of reinforced-carbon-carbon blankets, smoother and more aerodynamic than the black ceramic tiles near the nose cap and on the “jawline”—the forward-most part of the wing edge, where it meets the fuselage, just behind the cockpit. Tile also covered the leading edge of the vertical tail. These areas tolerated the 3,000-degree-Fahrenheit temperatures that reentry generated there. A black-tiled belly, a precisely engineered mosaic of unique tile shapes and thicknesses, also protected the vehicle against the blistering heat. The five orbiters NASA built became the most complex fleet the world has ever seen: Columbia, Challenger, Discovery, Atlantis, and Endeavour. Enterprise, which preceded them all, looked like an orbiter but flew only atmospheric approach and landing tests. (In the late 1970s, it was carried on the back of a 747 to altitudes up to 30,000 feet and released to glide back to the runway or dry lakebed at California’s Edwards Air Force Base.) Two orbiters were lost: Challenger in January 1986 during ascent (see “The Real Heavy Lifting,” p. 56), and, 17 years later, Columbia, during its return to Earth. The spacecraft got their names from naval vessels of exploration: Columbia, from one of the first U.S. Navy frigates, which, in 1836, circumnavigated the globe; Challenger, from a Navy ship that explored the Atlantic and Pacific Oceans for four years beginning in 1872; Discovery, from several British ships, including one Henry Hudson used to discover Hudson Bay; Atlantis, after a ketch operated for the Woods Hole Oceanographic Institution from 1930 to 1966; and Endeavour, built as Challenger’s replacement, from the ship James Cook sailed to the South Pacific in 1768 to see Venus passing between Earth and the sun. While a payload requirement of 32 tons may sound like a lot, the Saturn V had already put more than 142 tons into low Earth orbit. But Saturn didn’t have to bring any of it back. The shuttle was designed to not only deploy and service satellites but also, if necessary, retrieve them. In addition, it would have to be able to land with a maximum payload if the crew were forced to abort during ascent. Shuttle engineers were creating structures that had never gone to space. “The payload bay doors are one of the more interesting structural components on the vehicle,” says Dennis Jenkins, a contract engineer at the Kennedy Space Center in Florida who has worked on the shuttle for more than three decades and who wrote a definitive reference work on the spacecraft. “They can’t even survive in 1 G. They’re extremely fragile—just one layer of Nomex honeycomb composite [a graphite epoxy material]. If you ever look at pictures of it in the Orbiter Processing Facility, you’ll see great big yellow metal frames on the doors, and that’s because we can’t open the doors down here without those. 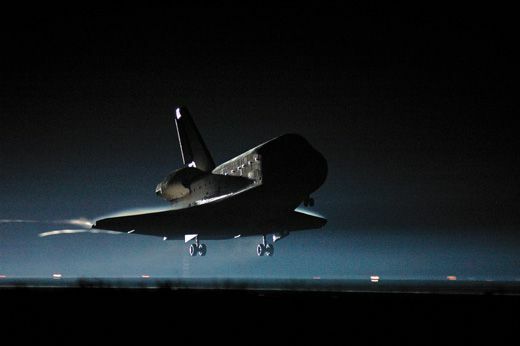 The doors just bend and twist too much, so we have to strengthen them on the ground.” (Jenkins is updating Space Shuttle: The History of the National Space Transportation System to include the program’s final missions.) “[The doors were] actually one of the first aerospace uses of complete composite construction,” he says.